Planet Express goes green... Really, really green! The term "law and order"
"Claw and Order" is the forty-eighth comic issue, which was released 24 March, 2010 in the US. After Fry beats Zoidberg at a life sized operating board game, which turns out to be a drunken cyborg, Zoidberg feels like a failure. Outside the bar, Zoidberg meets up with his uncle Zoid, and learns that his parents had a poor understanding of English and actually wanted him to be a lawyer, not a doctor. He decides to try being a lawyer, so he trades his doctor's licence for a law degree with a man he met on the internet. Meanwhile Fry has lost a few teeth in some peanut brittle, so Leela suggests he visit the the doctor. As Zoidberg is now a lawyer and Fry has no health insurance, he visits "Doctor" Bender, who diagnoses him with scurvy and suggests eating healthy fruit and vegetables. With Fry dying and it being Leela's day off, Bender heads off to make a delivery in Washington D.C. Elsewhere, Zoidberg is having difficulty finding a client until he walks in on Leela's phone call. Her parents need a lawyer willing to go into the sewers, so Zoidberg takes the case. Meanwhile, Fry learns that healthy food is too expensive and instead makes a few deals with a pair of shifty salesman to get some seeds. During Zoidberg's case, he accidentally clips off the accusing mutant's fake nose, causing the mutant to run away screaming, which invalidates his case against the Turangas. The case is dismissed, and Zoidberg is asked on a date by Vyolet. Fry's seeds grow while he is sleeping, and form a green, leafy duplicate of him, which bores the original Fry with football trivia, then releases spores. Bender has been arrested by the federal government for treason, so Zoidberg, as the only lawyer willing to represent him, heads to Washington. They have footage of Bender stealing surveillance tapes, and caught him loading them onto the ship, but he has no memory of it and when found guilty will be recycled into a playground set for orphans. 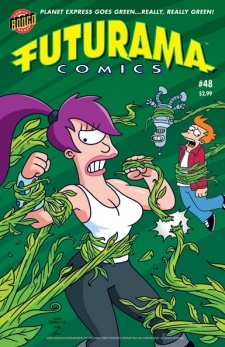 While reading a comic, Fry discovers that Leela, Hermes and Amy are now "planty" and dull. Professor Farnsworth walks in, recognises them as Podcast People and drags Fry to the safe room, where he explains that a mad scientist during the early 21st century attempted to make an ecologically green method of listening to podcasts, but the plants evolved to look like their owners, and there was no way to turn them off or change the topic. Soon people were literally being bored to death. Fry vows to stop them. Judge Whitey tries to declare Bender guilty based solely on appearance, but Nixon wants a fair, balanced, slow and painful trial. Zoidberg attempts to show that the footage is fake by showing footage of his own of Bender stealing candy from children but openly admits to the new tape is genuine. Nixon explains that Agnew let Bender into the oval office during a routine delivery, and was distracted by his new online video game. While Zoidberg is making his closing statement, Bender suddenly begins attacking Whitey. Back at Planet Express, the staff try to find away to kill the swarms of Podcast People. Fry is upset that he'll never finish reading the complete collection of Green Lantern comics, and begins explaining them in detail, causing the plants to starve from lack of attention. Bender's body has been taken away, and Zoidberg tries to plea bargain a lighter sentence with the Hyper-Chicken, who refuses but gives him an idea. When the trial resumes, Bender begins attacking Nixon. Yet again, he can't remember it. Agnew is called to the stand and is asked to play his video game, which causes Bender to attack Nixon again. It seems the system's wi-fi connection is on the same frequency as Bender's antenna and the game's objective was to rob the White House and kill anyone who got in the way, Bender is declared innocent. Zoidberg had decided he was a worse lawyer than a doctor and traded back his degrees and hired the lawyer for advice. Arriving back at Planet Express, Zoidberg gives Fry an injection for his scurvy, which turns his lower half into a sheep. It appears that part of Raoul's job as Supreme Mutant is acting as judge in legal disputes. Zoidberg: Doctor Zoidberg is dead! Hermes: Kill the zombie lobster! Zoidberg: No, I'm no longer a doctor! I'm just John Zoidberg, attorney at law! Hermes: I say we shoot him anyway! Zoidberg: I wish I could believe you. Bender: Zoidberg, if I'm lying, I swear I hope to spend the rest of my time on Earth as a playground bringing love and laughter to families everywhere! Zoidberg: [outside] My client is innocent. I know it. S.A.M. : I don't think they took my wallet. The laptop Zoidberg uses has a banana on the lid, in reference to the Apple logo's position on that company's laptops. The trading of a cow for seeds and the mention of "a beanstalk to a giant's gold" are references to Jack and the Beanstalk. Bender points out that Nixon's middle name is that of a Simpsons character. The promotional blurb indicated DOOP involvement, but they are not mentioned. Zoidberg and Harold Zoid imply that they've communicated with their parents. This could imply adoptive parents, but Zoidberg only mentions a Mum and Dad; he has been established as having three parents (Norm, Sam and Sadie) who are either a combination of biological and adoptive or just adoptive. In either case this comic mentions the wrong number of parents. While the podcast people have supposedly been contained, the first release of spores occurs outside on the Planet Express building's balcony. Organ Dealer and/or his clone and twin. This page was last edited on 12 February 2012, at 23:00.